Representative Honours: Northern Ireland: 79 Full Caps (2003-2016), 6 Under-21 Caps / 1 Goal (2002-2003), 4 Under-18 Caps. Club Honours: (with Southampton) FA Cup Runner-Up 2002/03; (with Fulham) UEFA Europa League Runner-Up 2009/10. Up to the closing weeks of the 2002/03 season Chris Baird had not even made the bench for a senior football match. That changed rapidly as he made his Southampton debut on 22nd March 2003 as a late substitute against Aston Villa at St Mary's, helping to set up a last minute equaliser in a 2-2 draw. He made his second senior appearance as a 26th minute substitute against Arsenal at Highbury on 7th May, at which point the Saints were already 5-0 down and on their way to a 6-1 defeat. Four days later Baird made his first Premiership start in a 1-0 win over Manchester City at Maine Road. The following weekend Southampton took on Arsenal in the FA Cup final at the Millennium Stadium in Cardiff. Baird had total of 158 minutes of firstteam football behind him but was given the right-back role of marking French international winger Robert Pires as Gordon Strachan sought to employ a more defensive formation than that which the Gunners had overrun just ten days earlier. In a performance that belied his lack of experience, Baird distinguished himself, twice clearing the ball from his own goal-mouth and even raising a good save from David Seaman with a 20 yard strike. Sadly Arsenal claimed the Cup with a 1-0 win courtesy of a Pires strike, but Baird was widely regarded as Southampton's Man of the Match. Already a Youth and six-time Under-21 international, the scramble to include Baird in the senior Northern Ireland set-up was palpable. He made his Full Northern Ireland debut in a friendly against Italy in Campbasso where an experimental line-up put in a decent display despite a 2-0 defeat. The following week an almost identical Northern Ireland line-up took on Spain in a European Championships qualifier at Windsor Park. The game, played right in the middle of the infamous goal-drought, was predicted to be an easy win for the star-studded Spaniards, but Baird was part of a resolute defensive display as a highly credible 0-0 draw was achieved. After such an impressive start to his senior career great things were expected of Baird. Sadly he was consistently overlooked by Gordon Strachan and his successors, Paul Sturrock, Steve Wigley and Harry Redknapp, over the following two seasons and he played just four Premier League games prior to Southampton's relegation in 2005. He did spend successful spells on loan at Walsall and Watford and he also retained his place in the Northern Ireland side through the closing months of Sammy McIlroy's managerial tenure and into the renaissance under Lawrie Sanchez. It was mid-way through the 2005/06 season before Baird finally established himself in the Southampton firstteam, earning the praise of new manager, George Burley. Burley also began to employ Baird regularly in the centre of defence and it was from this position that he was named as Southampton's Player of the Year for 2006/07. Highlights of the season included his first professional goal, a header in a 2-1 win over Luton on his fiftieth appearance and a thirty yard strike against Cardiff City as the Saints made the play-offs. Baird's versatility was put to good use by Lawrie Sanchez as he employed him in a defensive midfield role in games against Spain and Denmark in September and October 2006 due to the unavailability of the injured Damien Johnson. Northern Ireland's results in these games - a 3-2 win in Belfast and 0-0 draw in Copenhagen respectively - saw an impressive turnaround in form following a disappointing 3-0 defeat by Iceland. Sanchez's faith in Baird was further illustrated after his appointment as Fulham manager when he paid Southampton over £3 million for his former international player. 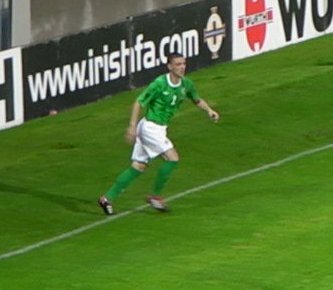 New Northern Ireland boss Nigel Worthington used Baird at centre-half for the first time at international level against Liechtenstein in August 2007, also appointing him as stand-in captain for Aaron Hughes. Although Liechtenstein were dispatched 3-1, the following matches in which he led out the team proved highly disappointing. He scored the own goal that gave Latvia a 1-0 win and in the following match Northern Ireland suffered a heart-breaking 2-1 defeat at the hands of Iceland. Bookings in each of these matches also saw Baird punished with a one match suspension. Although a regular at Fulham under Sanchez, Baird was initially a bit-part player under Roy Hodgson filling in only occasionally in midfield or defence. He had been on record describing defence as his favoured role but since early in the 2009/10 season Baird has been a regular as a defensive midfielder. For the 2010 Europa League final he was a surprise selection at right-back. In the Northern Ireland set-up too his regular right-back position came under pressure from Gareth McAuley though he still appears in midfield or central defence when required. Baird's name was linked with a move away from Fulham over a lengthy period, with possible destinations mentioned including West Brom and Southampton. He did not feature for club or country through the latter months of the 2012/13 season as he dealt with personal issues. When his contract expired in the summer of 2013 he was not offered a new deal. After a lengthy spell training with QPR, during which he featured for Northern Ireland against Portugal while unattached, Baird signed for Reading in mid-September on a short-term deal. Due to injury, Reading declined to retain him beyond the following January. He eventually joined promotion chasing Burnley in March on a deal that ran to the end of the season and he helped them secure second place. After rejecting a longer term deal with Burnley, Baird joined the Northern Ireland contingent at West Brom were he provided cover in a number of positions through the 2014/15 season. For 2015/16 he joined Derby County and was immediately appointed captain. It proved a difficult campaign for a club that had been hoping to clinch automatic promotion from the Championship and by mid-season Baird had been dropped. He briefly returned to Fulham on loan the closing weeks of the season as they battled to avoid relegation to League One. Despite the upheaval in his club career, Baird remained a vital part of Michael O'Neill's squad. He played in all but one of the games of the successful Euro 2016 qualifying campaign, the only blight coming with a foolish sending-off for two quick-fire yellow cards in the key match against Hungary. Baird went into the tournament still first-choice, but after the team put in an underwhelming performance in the opening match against Poland, Baird was one of several players to be dropped. Ultimately that proved to be his final Northern Ireland outing as he retired from international football before the start of the 2018 World Cup qualifying series. With 79 caps, at the time of his retirement Chris Baird was Northern Ireland's ninth most capped player. His international career had spanned the lows and highs of a tumultuous twelve year period, and he filled in with quiet efficiency in whichever position was required. His role in helping Northern Ireland to qualify for a first major tournament in thirty years should never be forgotten. Pictures courtesy of OJM, @ourweecountry and Chopper1 from OWC.